In this review I will be exploring the Grooming Paste from our friends at Every Man Jack. This is the 3rd and last review. In the first 2 we covered the body and face washes and in the second the shaving cream and post-shave lotion. Spoiler alert, the washes and shaving solution from Every Man Jack convinced us that this was a brand and product line that deserved our attention. Shout out to Sarah and Peter at Every Man Jack . Thank you for making these reviews possible. Now for the biggie: Hair Styling! 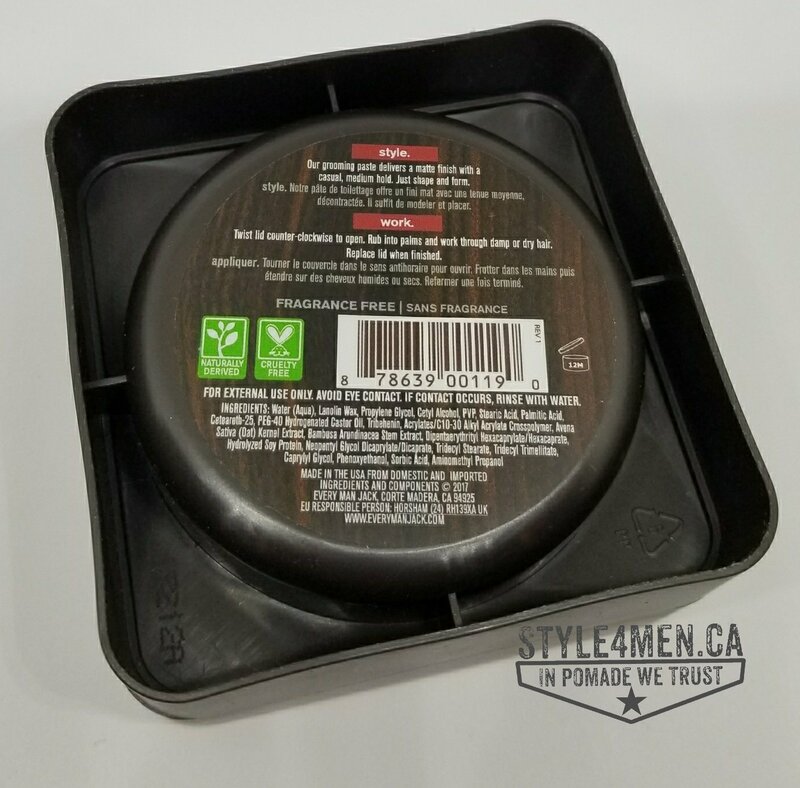 As you know, Style4mern.ca was launched as a result of our hair pomade fascination. In other words, winning us over with a product in this area will complete the conversion. I have been styling my hair for many many years, but honestly, with limited success for most of that stretch. At the time, gels and hair spray were the only real options and I never truly mastered them. Yes, I had some style but my understanding of hair products and their usage was limited as was my budget to explore. Compound this to my view that one product should do the job – period! Fast forward to today, I still believe that one product should do the job and this certainly is true when working with pomades and aiming for the style that they can produce, but like any man, one single style does not sum me up and there is a desire to achieve something different on some days. If you are looking for a natural matte finish with great volume, a grooming paste is something you have to try. Keep in mind that you may need or want to touch that up with hair spray or pomade. Grooming paste is a pasty substance that you will blend into damp hair in rather small quantities. By small I mean, less than a dime. When relaxing the product in your palms you will notice immediately how smooth this product is. It will be equally easy to evenly blend into your hair. I find it important to mention that working paste in damp hair is the game changer since paste is rather dry and will literally absorb all and any moisture around. In other words, you might have only a limited amount of time to work this in before the product starts to seize. 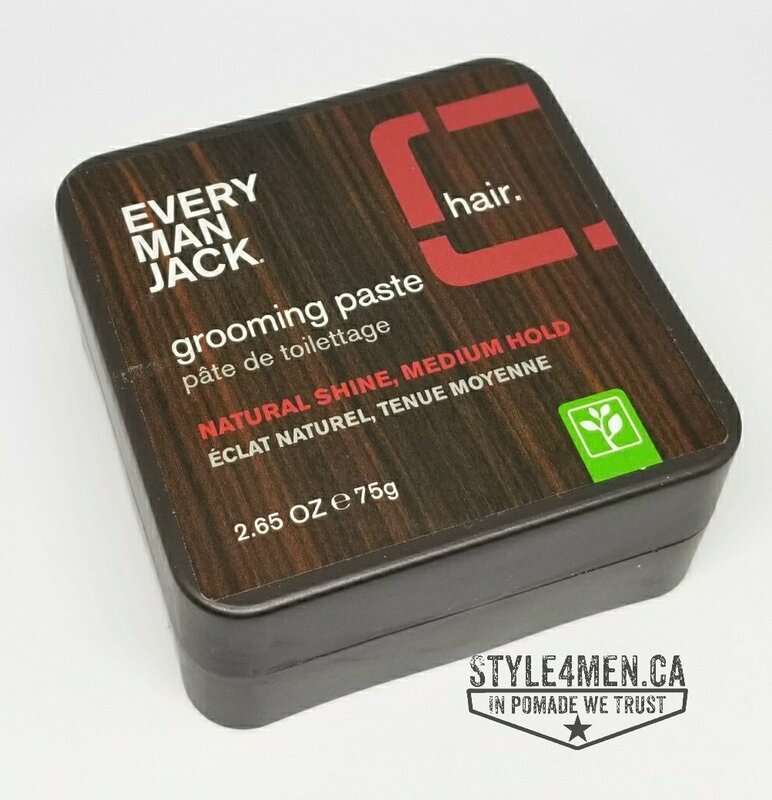 In my first test with the Every Man Jack Grooming paste, I had really damp hair and I might even have used too much product. To my surprise the product did not seize like I was expecting. This made for the hair drying step to be very pleasant. Over my tests of clay’s and paste, I have found that using a hair dryer is the real secret to successfully using this product. Yes, it is a more involved styling process but the natural finish and great volume are worth the trouble. Once my hair was dried, the results were very good. 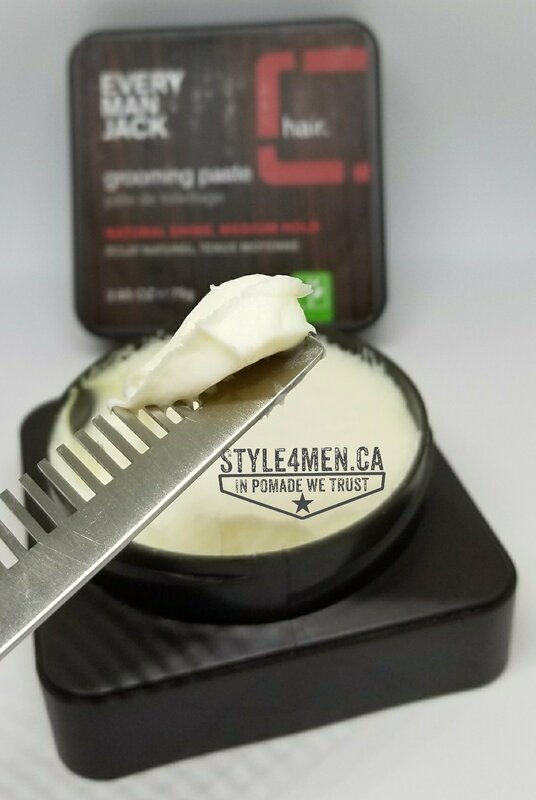 My expectation is to use the paste as a pre-styler to get volume and texture and to finally commit the style in place with pomade. With only the only grooming paste, my hair was smooth to the touch and very natural looking. My curls and waves were in full force. This is a very nice style for date night for example. If you want to finish the style, reach for your favorite pomade or hair spray to lock things in place. Since this paste is a water based product, working with hair spray is totally possible. When working with an oil based product that hair spray does not find a surface to stick or bond to. In closing, this Every Man Jack Grooming paste is a solid option to create volume and texture and natural looking results.